Located in the old town of Puerto fishermen. It has three bedrooms, dining room and fully equipped kitchen. A small patio and a large terrace with sea views. satellite TV, wifi, two refrigerators, washing and conditioning, hot and cold air. Nearby beach on the harbor of Porto Colom and Cala Marcal at the end of the bay. Portocolom is a little tourist town with few hotels, surrounded by beautiful coves very close to those accessible by car or through rural roads. Connect with rural life in Mallorca and the lifestyle of its inhabitants. Enjoy fishing, swimming, biking and hiking. A lovely quiet house a short walk to the main town. Close to a little beach (about 15 minute walk). The old town were the house is situated is the most picturesque part of Porto Colom. Easy to park on street outside. A lovely small supermarket around the corner open in morning only. A great place to stay and a less busy part of Majorca. We really enjoyed our stay in Cas Faroler. Portocolom is a beautiful, quiet, unspoilt town by the sea with lovely views and beaches. The house itself was clean and well-equipped with everything we needed. The roof terrace is very special and we enjoyed our breakfasts and lunches up in the sun even in April! Albert was very helpful when we arrived and went out of his way to sort out a mechanic to get a puncture repaired on our hire car which saved us a huge amount of time and hassle. Thanks Albert and Merce for letting us stay in your lovely house. Jolie maison, bien équipée et très bien placée! Nous avons passé de très bonnes vacances dans cette jolie maison sur trois niveaux (peu adaptée aux très jeunes enfants de moins de 3-4 ans), avec sa grande terrasse sur le toit, très agréable. La maison est très bien équipée et la climatisation est appréciable pour rafraîchir les chambres. C'est extrêmement calme et à la fois, on peut aller au resto à pied, tout comme aller chercher son pain, ou tout simplement se balader. La mer est à deux pas...c'est vraiment très sympa. Il est également facile de se garer dans la rue même de la maison, ou alors, dans les rues voisines. Le propriétaire est de surcroît très sympathique et disponible. Bref, une maison que nous recommandons! Nous avons été très satisfaits de notre semaine de location. Quartier très calme et à la fois proche des commodités et du port. Maison propre, bien équipée, avec notamment l'équipement nécessaire pour notre bébé de 1 an. Terrasse très appréciée !! Je recommande. Très bons échanges avec les propriétaires. Nous esperon vous voir une autre fois. Schön geräumig und pflegeleicht. Tolle Lage! Leider riecht die Wohnung etwas muffig, musste erstmal ordentlich lüften. Vielen Dank für Ihren Kommentar. Portocolom ist in der Tat ein feuchter Ort und wir haben alles getan, um es vor Feuchtigkeit zu schützen. 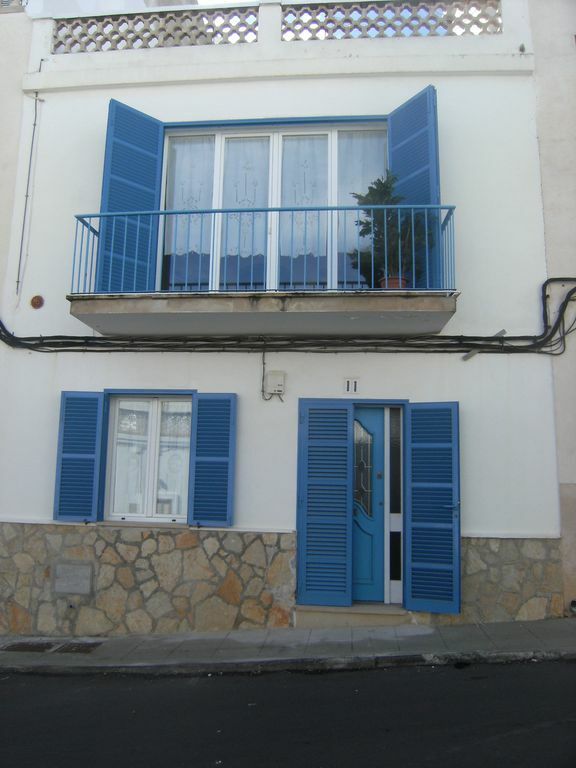 Town house in the old town of Portocolom. A natural port located in the Migjorn Mallorca with beautiful beaches and tranquil environment. Two-storey house and an upper terrace overlooking the sea. It has three bedrooms with room for six people, two bathrooms, dining room and kitchen. Portocolom is a quiet village near the mountain of San Salvador: until recently inhabited by hermits, where the entire island of Mallorca is visible. In your environment is Mondragó Natural Park, with its beautiful beach s'Amarador the famous "Cuevas del Drac" with stalactites and stalagmites and the island of Cabrera which is accessed from a boat Portocolom. Ideal to unwind and enjoy nature.